Spyralle is delighted and honored to be included in the celebration as a merchant in the anniversary marketplace and a stop on this year’s anniversary hunt, the Quasar Hunt. Our new exclusive for the market is the headpiece shown above. It is actually the first, not the 11th edition, but what number could we give it, besides 11? Fans of Fallen Gods (and by now it should be obvious I am one) and of Libertine, its companion brand of décor and prefab buildings, know about the Eggs. Alia’s collectible confections in miniature commemorate his full size creations as well as thoughts, themes and, no doubt, memories, in the style of the fabulous eggs created by the House of Fabergé. I am not a “completist,” by any means but I seem to have collected quite a few Libertine Eggs, more than I have room to display. Such treasures deserve more than a simple shelf, so I created a whimsical display case. 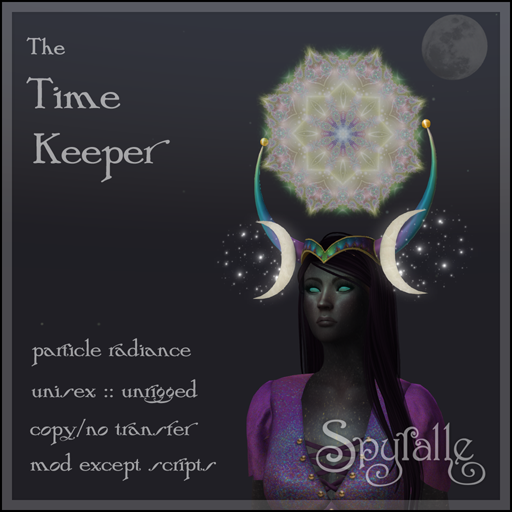 This is Spyralle’s prize in the Quasar Hunt. You don’t have to display Libertine eggs in it; all kinds of treasures can dwell in these niches. 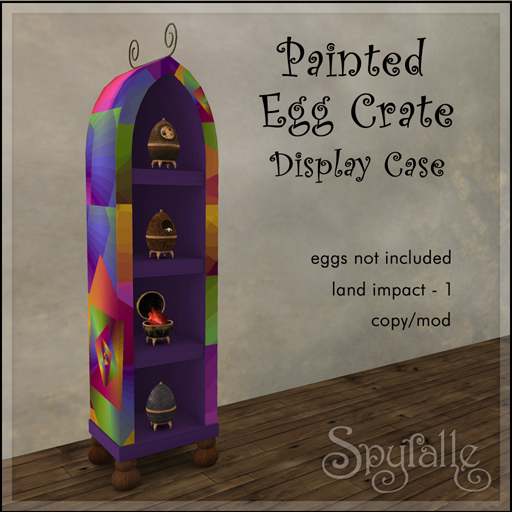 True, the Egg Crate has space for only four eggs, but you can copy it. Perhaps I need to make a bigger one. The 11th Anniversary continues through October 31. I urge you to go. And – a word to the wise – a thorough, persistent and shamelessly snoopy exploration of the entire Fallen Gods archipelago of four regions will give you more eye candy than you can take in and many surprises, not to mention a head start for hunts this year and in the future! The model wears skin and glowing eyes from Fallen Gods, Victoria hair from Wasabi Pills, LAQ’s Cherry head (which might as well have been made for these skins), a personal shape and Spyralle’s Sybil Dreaming dress. The Sybil gowns are now available at Spyralle’s Park Place store. This entry was posted in Events, Home & Garden, Hunts, New Release and tagged Fallen Gods, fantasy, fractal, Headpiece, Hunt, Spyralle, Wasabi Pills. Bookmark the permalink.